Town Square Energy - Variable Rate Explained! We will only increase our variable prices when the underlying market prices require us to do so. Because electricity demand determines the price of market prices, the weather is one of the most important factors affecting electricity demand. As as a result, natural increases will be noticed in the peak winter and summer months. Below is a projected forecast of our Variable Rate. Why A Range In Our Variable Rate? Not all customers on a variable rate will pay the same rate in a given calendar month. Pricing variations from customer to customer are due to billing cycle timing, renewable energy percentage, and account-specific consumption characteristics. As a general rule, and as is shown in the diagram below, the variable price will most often be higher in the summer and winter months and lower in the spring and fall. 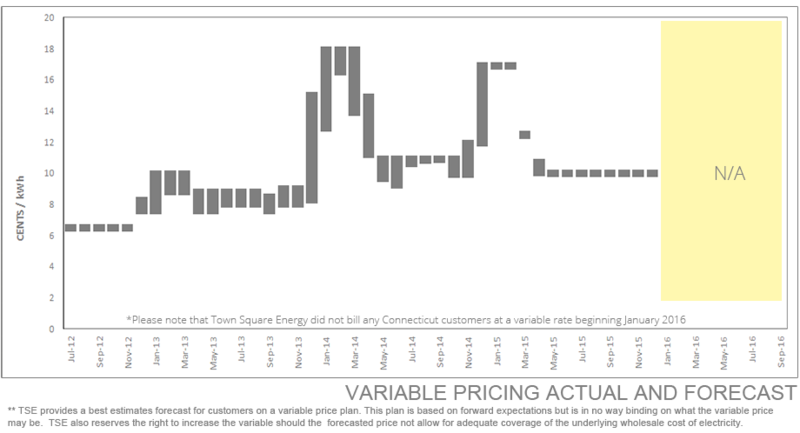 When wholesale electricity prices fluctuate, so will the Town Square Energy Variable Price. You can expect that variable prices will change from month to month. When you choose a variable price, you may be selecting a lower price now in exchange for higher prices later, depending on market conditions. In essence, you will be choosing a market based price that can change from month to month. For those who do not want to monitor variances in price, we recommend that you consider our fixed rate offerings for long term price stability. Different customers have different needs. If you need help choosing what is best for you or your business, please contact us. We are ready to help.